There are a ton of solutions for image deployment and pre-execution environments. The latest deployment services tools provided free by Microsoft are solid and effective. WinPE has been around for awhile and is utilized by many vendors for use in their products (Altiris). While not a full Windows OS it provides a very robust command-line environment that is customizable to your needs. For a graphical alternative to WinPE that provides similar functionality, see Bart's PE. First thing grab and install the latest Windows Automated Installation Kit (WAIK) for Vista and Server 2008 on what will be considered the "technician PC". Run the WinPE Tools command prompt from the start menu. The first thing we need to do is create the base PE construct which you can do for either x86 or x64 architectures. Note that for the 64-bit artchitecture it is referenced as "amd64". You could stop right here, create the ISO and burn your CD but let's customize it a bit first. To do this we have to mount winpe.wim using imageX. 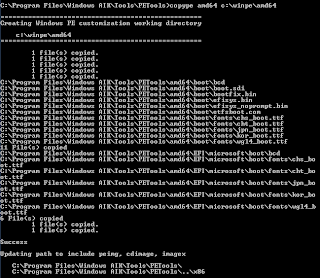 If you browse now to the c:\winpe\x86\mount (or amd64) directory you will see a familiar construct of a windows file system. Scripts, utilities, or other supported apps can be copied into the file structure for inclusion in the final image. WinPE supports inclusion of some basic packages which will enable support for a few different types of applications. 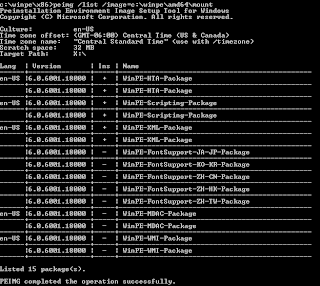 The peimg command is now used to list which packages are available. The "Ins" column indicates if the package is installed or not by the - (not) or + (is) signs. Depending on your needs you can install each of these packages for either CPU architecture. Once you've installed the packages you need and changed the TZ run the peimg /list command again to verify the changes. Imagex is the utility used for image capture and deployment and can be configured to exclude unnecessary files from image capture. Create a new text file in the mounted file system \mount\windwos\system32 and rename it to wimscript.ini. Once you're done customizing it's time to prepare the image. This process removes all non-installed packages from the final image and reduces its size. This will also seal the image making no further package installations possible. No DVD+/-RW drive? No problem, boot to PE with a USB drive attached or map to a network location that has the extracted ISO to the OS of your choice. Run setup from that location.